A minty habit can be hard to break. Menthol is to blame. My name is Erica, and I was once addicted to menthol. Specifically, I was hooked on Halls mentholated cough drops. 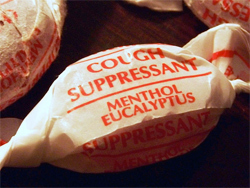 When I was in high school and college, it was not unusual for me to go through a bag of cough drops a day. I didn’t think of it as addiction at the time. In fact, I’d pretty much forgotten about my former habit until this past year, when I found out that the FDA is considering banning menthol in cigarettes. Some public health advocates have argued that menthol may be addictive on its own, or, at the very least, that it makes quitting smoking more difficult, and their evidence is pretty convincing.